I'm a Windows user coming to Ubuntu's Bash thanks to WSL. Now I need to edit some files and I really hate Vi. Do I just have to deal with it, or is there a simpler alternative? I will try to master Vim, but I need to make a quick edit right now! If you are looking for an alternative editor, you are not alone. Basically life is too short to learn vi and I say this being a software developer for a living. However you should learn how to exit it because it's a problem for one out of 20k programmers. Also performing some basic append/insert operation might be worth learning, because on some stubborn servers you won't find any other editor. Now, the answer to your question is probably nano. It is a matter of opinion. 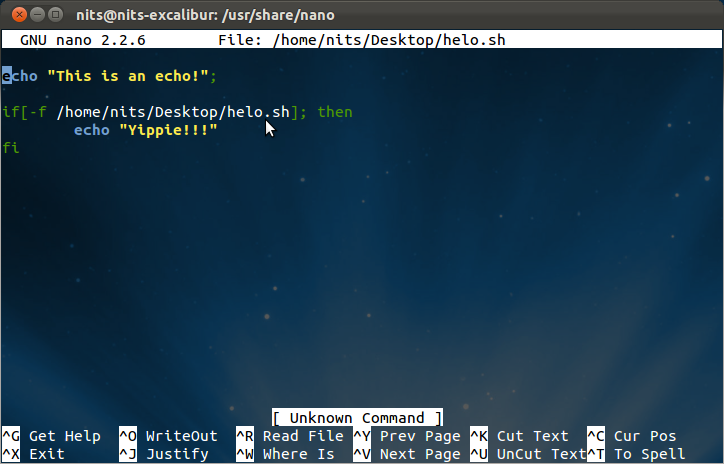 Beginners use nano https://www.howtogeek.com/howto/42980/the-beginners-guide-to-nano-the-linux-command-line-text-editor/ . Commands are issued with the control key and are listed at the bottom of the editor window. For a guide on syntax highlighting see How do I enable syntax highlighting in nano? emacs is an alternate to both vim and nano and has many benefits as well. 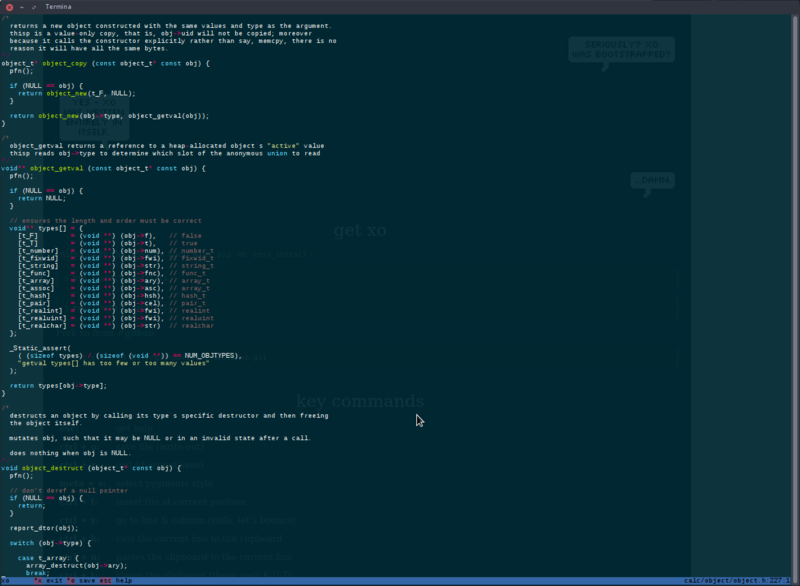 emacs is more complex than nano. ...any of the little lisper that you read as an undergrad? A small, brave world awaits! While we're advocating for our favourite lightweight text editors, let me recommend the eXcellent, tiny, and fast xo (exofrills). Less than 850 lines of code in a single file! 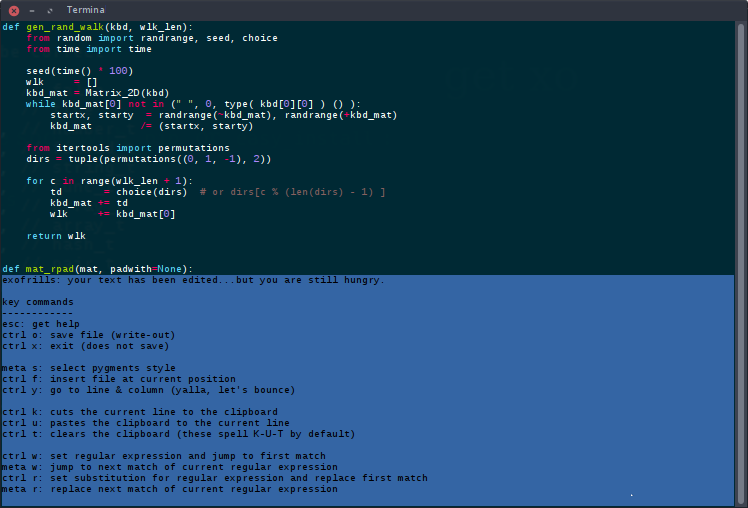 Regular expression matching and replacing! Hop between words on a line! Jump to anywhere in the file! Beginner friendly - maybe you are new to words! Only one row of non-text editing space! exofrills: your text has been edited...but you are still hungry. Disclaimer: I am in no way affiliated with the exofrills project. as a windows poweruser , after trying vim and nano I found out that I need something in between, complexity wise. so I tried slap and It was the thing that I was looking for. 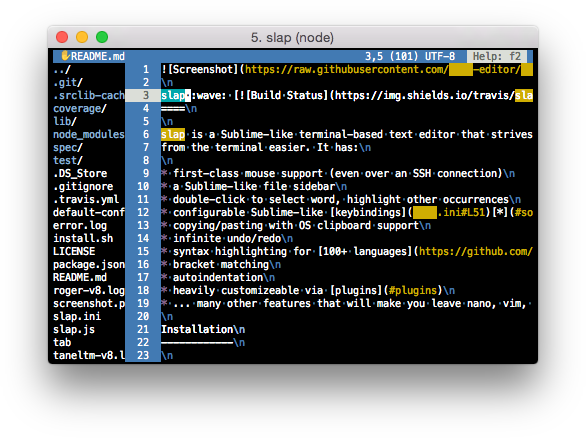 slap is a Sublime-like terminal-based text editor that strives to make editing from the terminal easier. While I cannot deny that I too struggled with vi in the beginning, I think an argument can be made that vi is actually very simple to learn. (When I began using Unix the choice was either vi or emacs, so at the time I chose ed, ed being a very simple line editor, which I had learned already from reading early Unix textbooks.) I use vi daily, but I probably use only a very small subset of its features. Here's first an argument for using vi: vi exists on all systems, uses very few resources, and may be usable over unstable and slow connections, where other editors may fail or be slow and unusable. Or in situations where the system is broken, so arrow keys are not interpreted correctly (bad terminfo settings for example.) So vi can be used to fix the configuration files leading to the problem, without being affected by the problem. Entering Ex mode. Type "visual" to go to Normal mode. w writes all (or the chosen range of) lines to a file. s substitutes a regular expression. It's good to know regular expressions! q quits. wq writes and quits. q! quits without writing, and in a similar vein, w! forces a write to a file if possible.
! as a command filters the lines into a shell command. enters VISUAL mode. Don't be fooled. 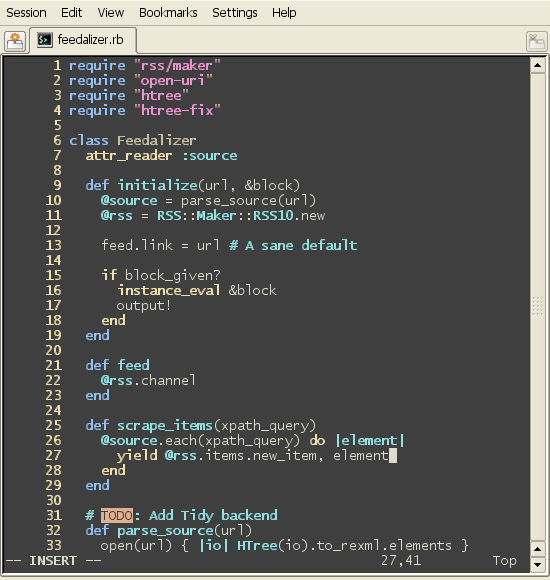 It looks like an editor, but it's still just an interactive programming shell. You just get to look at the buffer all the time, and a few more commands. In visual mode a : shows the : prompt from ex mode. The arrow keys (if they work) move around, and if they don't, then hjkl do! h left, j down, k up and l right. 0 moves to the first character and ^(think regex here!) to the first non-space character on the line. $ (regex again!) moves to the end of line. Typing :999¬ goes to line 999, naturally, just like in ex mode. "i" enters insert mode, which now inserts on characters instead of lines, and ends with pressing escape instead of ".¬". "I" inserts at the beginning, "a" after the character under the cursor, and "A" after the end of the current line. Always press escape when done typing text. "x" deletes the character under the cursor, and "D" deletes from the cursor to end of line. "Y" yanks (copies) the current line, and "P" pastes it back. ":pu" does the same, but can be preceded by a line number. ":ya" is the ex equivalent of "Y", and again, useful to apply to a line range. I think there is a mark command as well, but I will admit I don't remember it. I don't miss it. The above is what I use, and I know I am probably not a very "efficient" vi user. On the other hand, I do use ex's versatility, for example to script editing configuration files. Need to change your hostname foo.bar.com to www.foobar.com in a number of conf files? What I am trying to say is, that I think the problem with vi is that people think of it as a difficult editor. All it takes is to change your mindset a little, and view it as a very simple yet also very powerful interactive programming language instead. So powerful that even with a subset of the available commands, you can use it to great effect - not just as an editor but as a general, scriptable tool well integrated with the rest of Unix. I doubt nano would do all of this - emacs...maybe. Not the answer you're looking for? Browse other questions tagged command-line software-recommendation text-editor vi windows-subsystem-for-linux or ask your own question. How do I enable syntax highlighting in nano? True column-mode (block-selection and editing) text editor solution? Is there a good alternative hex editor instead of HxD editor?